TuneUp Utilities 2009 is a all-in-one system management and optimization utility that optimizes the computer machine for faster, healthier, and smoother performance. TuneUp Utilities 2009 provides a well-integrated collection of tools that saves time and hassle when dealing with various system issues over alternative methods, including startup, uninstall, and performance optimization procedures. TuneUp Utilities 2009 features new redesigned Start page which status summary, TuneUp Speed Optimizer to identify which settings slow computer down, TuneUp Shortcut Cleaner to remove invalid shortcuts from the Start menu, the Desktop and the Quick Launch bar, TuneUp Styler to customize appearance such as logo animation and logon screen, TuneUp Uninstall Manager, TuneUp StartUp Manager to identify unnecessary autostart applications, and allows user to free up disk space. TuneUp Utilities 2009 also adds support for the Opera browser. TuneUp Utilities listed price is normally $49.95. As part of Christmas Advent Calender promotion, Chip.de magazine is giving away full version TuneUp Utilities 2009 for free. Do note that TuneUp Utilities 2009 is an older version of TuneUp Utilities, and it does not officially support Windows 7. 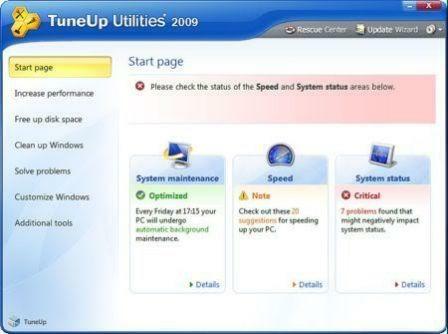 So, install TuneUp Utilities 2009 in Windows 7 is prohibited, although user can get it installed on Windows 7 with Compatibility Mode workaround, but its settings and recommendations may not work best in Windows 7. Only TuneUp Utilities 2010 is compatible with Windows 7. At the German TuneUp Utilities product key registration page, enter a valid email address, and then enter the Captcha code appear on the web page. Check email Inbox for a confirmation email from “TuneUp Promotion <no-reply@tuneup.de>” with the subject of “TuneUp Utilities 2009 Freischaltlink”. Click on the confirmation link in the email. The link in email will be forwarded to open up a web page with TuneUp Utilities 2009 Personal Product Registration Key Number. Note down the genuine serial number for TuneUp Utilities 2009. Install TuneUp Utilities, and use the personal registration code to register and activate the full version product by clicking on “Enter Product Key” when prompted. Another method to download TuneUp Utilities 2009 for free.